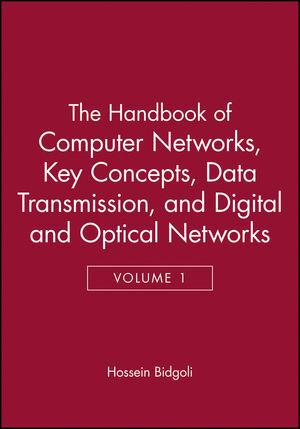 In this first volume of The Handbook of Computer Networks, readers will get a complete overview of the key concepts of computers networks, data transmission, and digital and optical networks. Providing a comprehensive examination of computer networks, the book is designed for both undergraduate students and professionals working in a variety of computer network-dependent industries. With input from over 270 experts in the field, the text offers an easy-to-follow progression through each topic and focuses on fields and technologies that have widespread application in the real world. Hossein Bidgoli, Ph.D., is professor of Management Information Systems at California State University. Dr. Bidgoli helped set up the first PC lab in the United States. He is the author of 43 textbooks, 27 manuals, and over five dozen technical articles and papers on various aspects of computer applications, information systems and network security, e-commerce, and decision support systems published and presented throughout the world. Dr. Bidgoli also serves as the editor-in-chief of The Internet Encyclopedia, The Handbook of Information Security, and The Encyclopedia of Information Systems. The Encyclopedia of Information Systems was the recipient of one of the Library Journal's Best Reference Sources for 2002 and The Internet Encyclopedia was recipient of one of the PSP Awards (Professional and Scholarly Publishing), 2004. Dr. Bidgoli was selected as the California State University, Bakersfield's 2001–2002 Professor of the Year. Guide to The Handbook of Computer Networks. Volume I: Key Concepts, Data Transmission, and Digital and Optical Networks. The Telecommunications Industry (David G. Loomis). Data Communications Basics (Hossein Bidgoli). Data-Link Layer Protocols (Stefan Joe-Yen and Chadwick Sessions). Network Layer Protocols (Muhannad Harrim, Mohamed El-Wakil, and Ala Al-Fuqaha). Transport Layer Protocols (Vassilis Tsaoussidis). Session, Presentation, and Application Layer Protocols (Chadwick Sessions). Digital Transmission (Marvi Teixeira and Viktor Zaharov). Analog Transmission (Hamidreza Saligheh, Joonhyuk Kang, Jaehak Chung, and Vahid Tarokh). Voice Communications Systems: KTS, PBX, Centrex, and ACD (Hassan Ibrahim). Messaging Systems: Facsimile and Voice Processing (Albert K.S. Wong, Nan Zhang, and Xu Yan). Public Switched Telephone Network (Jingxuan Liu and Nirwan Ansari). Information Theory (David Blockus and Mark Stamp). Data Compression (Chang-Su Kim and C.C. Jay Kuo). Speech and Audio Compression (Peter Kroon). Multimedia Streaming (Nabil J. Sarhan). Part 2: Hardware, Media, and Data Transmission. Modems (Darren B. Nicholson and Jennifer A. Nicholson). Conducted Communications Media (Thomas L. Pigg). Wireless Channels (Okechukwu C. Ugweje). Sources of Errors, Prevention, Detection, and Correction (Syed H. Murshid and Azhar M. Khayrattee). Bridges (Zartash Afzal Uzmi and Tariq Mahmood Jadoon). Pulse Amplitude Modulation (Muneo Fukaishi). Frequency and Phase Modulation (Albert Lozano-Nieto). Carrierless Amplitude Phase Modulation (Tim Collins). Minimum Shift Keying (Tao Jiang). Optical Differential Phase Shift Keying (Xiang Liu). Pulse Position Modulation (Jon Hamkins). Digital Phase Modulation and Demodulation (Zartash Afzal Uzmi). Frequency Division Multiplexing (Zhu Liu). Time Division Multiplexing (William A. Shay). Statistical Time Division Multiplexing (Kavitha Chandra). Orthogonal Frequency Division Multiplexing (Shinsuke Hara). Wavelength Division Multiplexing (Yassine Khlifi, Noureddine Boudriga, and Mohammad S. Obaidat). Part 3: Digital and Optical Networks. Digital Communication Basics (Robert W. Heath and Atul A. Salvekar). Digital Radio Broadcasting (Zhuojun Joyce Chen). Spread Spectrum Signals for Digital Communications (Filippo Giannetti and Marco Luise). Optical Fiber Communications (Habib Hamam and Sghaier Guizani). Optical Transmitters, Receivers, and Noise (Ken Pedrotti). Optical Signal Regeneration (Mingshan Zhao). Optical Sources (Tin Win and Serge Demidenko). Lambda and Sub-Lambda Switching (Mario Baldi and Yoram Ofek). Optical Cross Connects (Wen-De Zhong). Optical Memories (Paul W. Nutter). Characterization of Optical Fibers (Liang Chen, John Cameron, and Xiaoyi Bao). Optical Couplers and Splitters (Kais Dridi, Mustapha Razzak, and Habib Hamam). Fiber-Optic Filters and Multiplexers (Hamid Hemmati). Optical Solitons (Natalia M. Litchinitser). Synchronous Optical Code Division Multiplexing Systems (Hideyuki Sotobayashi). Free-Space Optics (John Liu and Mark Schaefer). Optical Switching Techniques in WDM Optical Networks (Amor Lazzez, Noureddine Boudriga, and Mohammad S. Obaidat). SONET and SDH Networks (M. Farooque Mesiya). Passive Optical Networks for Broadband Access (Nirwan Ansari and Yuanqiu Luo).